It’s Hurricane Season. It’s Junk Science Season. Pretty much he same things in these days of Anthropogenic Global Warming. Female-named storms have historically killed more because people neither consider them as risky nor take the same precautions, the study published in the Proceedings of the National Academy of Sciences concludes. Researchers at the University of Illinois and Arizona State University examined six decades of hurricane death rates according to gender, spanning 1950 and 2012. Of the 47 most damaging hurricanes, the female-named hurricanes produced an average of 45 deaths compared to 23 deaths in male-named storms, or almost double the number of fatalities. (The study excluded Katrina and Audrey, outlier storms that would skew the model). I pondered the authors’ analysis for about 15 seconds. “Bullsh*t,” I thoughtfully concluded. And after about 15 minutes on The Google™, I found the following facts to reinforce my skepticism. From Wikipedia: The Weather Channel began service in May, 1982. Building codes have been stiffened in coastal areas. [Update #2: I emailed the authors of the paper, stating my skepticism and asking if they had considered items 1-3 above. I received a polite response assuring me that they had. The author was kind enough to furnish me with a copy of the paper, along with a spreadsheet of their database. I still find the study fraught with problems. 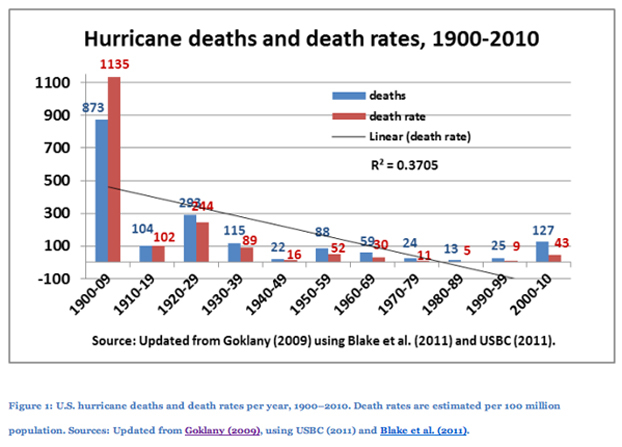 …[Our] model suggests that changing a severe hurricane’s name from Charley (MFI = 2.889, 14.87 deaths) to Eloise (MFI = 8.944, 41.45 deaths) could nearly triple its death toll. MFI is the “perceived masculinity-femininity of hurricane names” on a 1 to 11 scale, so that a 3 is “relatively masculine” and 9 “relatively feminine”. The basis of the study is the masculine-feminine perceptions of nine “coders”. To test their hypothesis about gender-bias, the authors performed six experiments, designed to test how strong the subjects’ perceptions of storm strength was based on name, how likely they would be to evacuate, etc. In all cases the subjects were either students at the University of Illinois at Champaign-Urbana (where the key authors are in the Departments of Business Administration, Psychology and something called “Women and Gender in Global Perspectives”), or anonymous online subjects at Amazon Mechanical Turk. As a thirty-year resident of the Gulf Coast, and an equal-opportunity evacuee*, I posit that the test subjects’ answers are in no way representative of the behavior of actual hurricane “targets” during an actual storm. Hurricane Agnes (1972, Cat-1) killed 117 according to the authors’ database. Fifty of those were in inland Pennsylvania! Are we suggesting that those people would have made evacuation plans (to where?) had they not been so sexist? Or if NHS had chosen a more butch name? This is preposterous. Hurricane Sandy (2012, Cat-2, killed 159) also skews the results. The name Sandy, which I’ve always thought was quite androgynous, rates a solid 9.0 MFI (“relatively feminine”) for the coders. Remember, too, that Sandy was a modest late-season hurricane that went extra-tropical, striking the nation’s largest metropolitan area. The freak nature of the storm, combined with the fact that it hit an area unaccustomed to such storms amplified its impact. The good people of New York/New Jersey/Connecticut are not sexist! As always, correlation is not causation. The observed effect has nothing to do with sexism and everything to do with ongoing advances in hurricane safety and quirky storm naming practices. And a little bit to do with random chance. The study is pure politically-motivated crapola, pure and simple. The National Academy of Sciences should be ashamed. * Andrew (2.2 MFI), Lili (10.3), Rita (9.5), Gustav (1.7). This entry was posted in Climate, Environment, Louisiana and tagged Crapola, Hurricanes, Shinola. Bookmark the permalink.